Railroads were integral to the development of the United States during the Industrial Revolution, westward expansion and settlement, and were an important factor in the Union's victory over the Confederacy during the Civil War. In addition to their use as transport for imports and exports, trains also greatly changed the style of passenger transportation; offering a smooth and comfortable ride, with dining and sleeping cars for wealthier passengers. 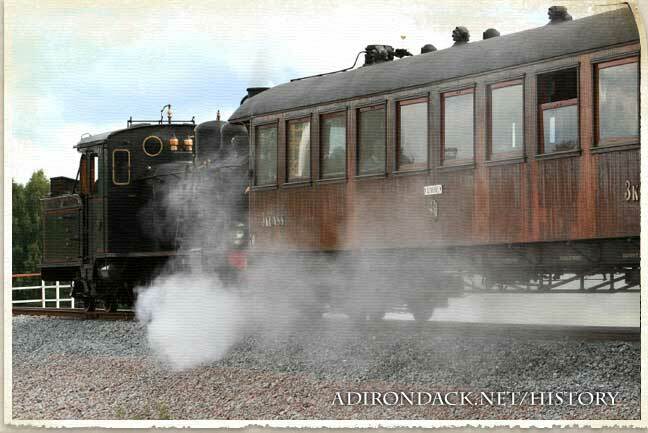 In the Adirondacks, trains were vital in carrying tourists to the area. In 1864, Dr. Thomas Clark Durant, vice-president of the Union Pacific Railroad, began construction on the Adirondack Railway (originally Adirondack Company), which was completed in 1871. Following the Civil War, a higher emphasis was put on participating in leisure activities. Technological advances in train travel and the construction of rails in the area allowed for increasingly easier access to the Adirondacks for residents of New York City, who began to regularly vacation among the park's lakes and mountains. The trains transported the well-to-do to their summer homes and the newly constructed resort hotels throughout the region. After Durant's death, his son sold the railway to the Delaware and Hudson Canal Company in 1889. The line became known as the Adirondack Branch of the D&H Railroad in 1902. The railway survived the Great Depression (see Snow Trains below), but closed down during World War II. It was extended and reopened in 1944 when titanium mining reinvigorated the town of Tahawus, and the North Creek Railroad Station remained open until 1989. The original tracks were used as part of the Saratoga & North Creek Railway, which ran from 2011 to 2018. On September 13, 1901 Vice President Theodore Roosevelt was hiking Mount Marcy in the Adirondacks when he received word of the deteriorating health of President McKinley following the assassination attempt against the president a week earlier. Roosevelt left the area from the Tahawus Club near Newcomb to begin his famed midnight ride to the North Creek Train Station. While at the train station Roosevelt received word of President McKinley's death. Upon hearing the news, Roosevelt proceeded immediately to Buffalo on the fastest train, where he was sworn in as the 26th President of the United States. The North Creek Train Depot welcomed its first snow train early in the spring of 1934 bearing 378 skiers for a round-trip price of just $1.50 per person. Leaving Grand Central Station or Schenectady after midnight and arriving in North Creek in the morning, the snow trains of the 1930s offered people from the city the chance to getaway for two ski packed days, and then return to the city in time for work on Monday. Trains in the Adirondacks survived the Great Depression in part due to the snow trains that ran from Schenectady and New York City in the 1930s. Skiers flocked to the first downhill ski center in New York State, the North Creek Ski Bowl, which was constructed on the slopes of Gore Mountain. Though the snow trains ended in the 1940s with the onset of World War II, they returned in 2011 as a part of the Saratoga & North Creek Railway. The last snow train ran in April 2018, marking the railway's closing.